Ok so I know this looks tricky but I promise you there’s a technique in here that you’ll be happy to use in any chicken wing recipe. Its really simple as long as you follow closely and ensure you follow my my top tips. 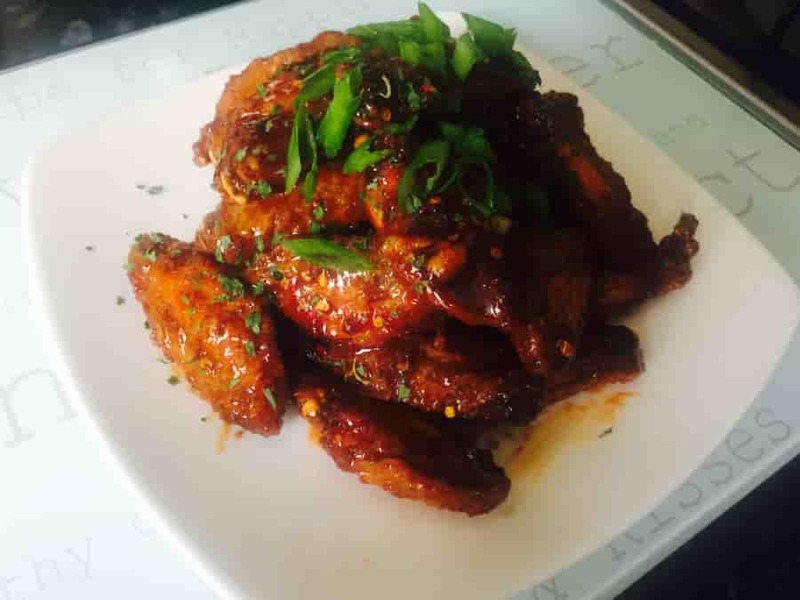 Tip 1: The main focus of this recipe is the baking powder technique used to get crispy chicken wings without the added fat and grease. The actual glaze recipe and seasonings can be adapted to any flavour you want, soy ginger, BBQ, garlic parmsean and more, be creative! Tip 2: Be sure that your wings are completely dry before applying the dry rub seasoning. You want them to get as crispy as possible before adding the glaze. A chicken wing is divided into 3 parts. The drum, flat and tips. In this recipe I chose to use just chicken flats but feel free to add the drum too. I’d advise against the tips as they burn quickly and don’t have much flesh, keep those in the freezer for making your own chicken stock. In another bowl, mix together your dry rub ingredients, toss a 1⁄3 of the mixture onto the chicken and continue to do this until the dry rub is done and chicken wings are completely coated. Be sure to do this in steps so it ensures all parts of the chicken are coated. Lay out your wings on a wire rack and allow space between wings, none should be touching so they cook and crispen up evenly. (Line your sheet with foil to catch any drippings). Place the wings into your preheated oven for 20 minutes. After 20 minutes turn your wings over so the other side can cook evenly. Leave the wings in for another 20 minutes, turn them over for a 3rd time and bake for a final 10-15 mins until crispy. This will give you the crispiest juicy wings. Once your wings are cooked, leave them to rest for about 5 minutes. Within these 5 minutes, in a bowl mix together your glaze ingredients. Make sure you taste and adjust to your liking. Once you’ve allowed your wings to rest, add them to a big enough bowl and pour over the glaze from a height, toss to coat the wings or use tongs. Add a little at first then more if you need, you don’t want soggy wings. Finally you’re all done! Dish it on a flat plate and garnish with parsley, lime zest( I feel this cuts some of the sweetness) and spring onions! Enjoy!